If you are trying to gain weight but are unable to achieve the desired results, there are quick and easy solutions now available in the fitness scenario which helps you to achieve desired results within a short time period. Endura Mass is a popular weight gaining supplement for easy weight gain. The brand Endura was founded in 1996 by a team of health professionals who were experts in the nutrition field. No doubt, it gives noticeable results in short span of time. However, other factors like proper sleep, healthy diet and exercise contribute a lot to the overall body health also have impact on the results of the product. You must follow a healthy lifestyle in order to achieve best possible results. Endura Mass is a daily diet supplement with complete vegetarian ingredients. It provides energy and vital nutrients to the body which helps underweight people to gain weight. Endura mass has a combination of natural and artificial nutrients which are vital for body and muscle growth. Soy protein has sufficient amount of amino acids which are essential for human body. 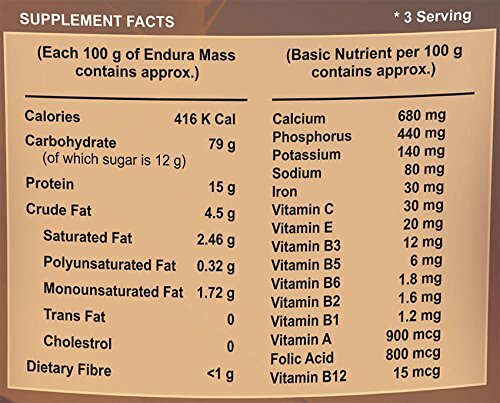 Endura Mass contains high amount of carbohydrates which helps increase body weight. Endura Mass is available in four flavors as Vanilla, Banana, Strawberry and Chocolate. Its primary ingredients are soy protein isolate, minerals, whole milk powder, sugar, maltodextrin, palm oil, emulsifying agents, sweet dairy whey and vitamins. Endura mass claims to supply an additional 3500 calories to the body. For achieving best results, it is suggested to consume it along with a nutritional and well balanced diet, and indulge in regular exercise. With Endura Mass you can expect a visible result in 20-30 days. How to consume Endura Mass? Diet supplements must be consumed in an appropriate quantity to obtain desired results. The normal dosage consists of 3-5 teaspoons (30-50 g) of powder with a glass of water, milk or juice twice in a day. For better results, use full cream milk and eat two bananas. You can also prepare a healthy milk shake by blending bananas or ice-cream. Start with 40-50 g of serving once a day and gradually increase to thrice a day. Take it in the morning or in the evening or after the workout so that it can be digested easily. Do not take it immediately before going to bed at night. Diabetics should avoid the consumption of Endura Mass as it contains sugar. Males and females aged above 15 can consume Endura Mass. Senior citizens who don’t possess any kind of serious ailments or gastric problems can also consume Endura Mass. Though it is claimed to be free from any side effects, there are some possible poor aspects with the good aspects of Endura Mass. It contains organic protein which is absolutely a vegetarian product that improves energy, stamina, and capability to work. It helps to get rid of anxiety, lethargy, and mental tiredness. The flavors of Endura Mass are delicious and can be consumed without harming the taste buds. It does not stunt your height. Various minerals and vitamins content make it a complete supplement. It may cause several gastric problems in some people. When the consumption of Endura Mass is stopped few months, you may start losing your weight again within few weeks or months. Though it assures permanent weight gain, outcome may vary from person to person. The excessive and uncontrolled use of Endura Mass may cause several adverse effects including hormonal imbalance, abnormal liver function and muscle damage due to increased blood sugar levels, low bone density and high level of unwanted fats. Next articleWhat are the Benefits of Consuming Protein Supplements? Endura Mass is one of the best health supplements that I have ever had..